Chinese companies must improve their quality and brand image to gain a competitive edge in the global arena, according to a recent survey by London-based Interbrand Consultancy. 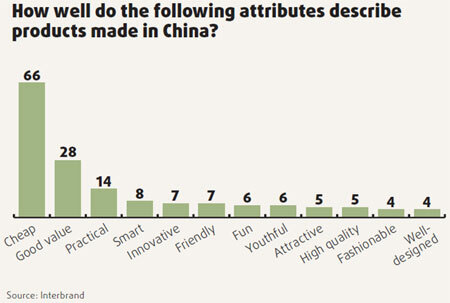 The “Made-in-China” survey interviewed over 700 business professionals on their perceptions about products made in China and the potential for Chinese brands going overseas. The survey revealed that Chinese brands were unable to cash in on the Olympics goodwill largely due to the tainted milk powder scandal. “Products made in China continue to represent the image of cheap price and low quality with safety problems,” the survey said. Rising raw material and labor costs along with a weakening US dollar have forced many companies to rework and rethink their strategies for tapping the overseas markets. The study expressed the view that local IT, consumer electronics and mobile phone firms should take the lead to become global brands. “Made-in-China products still have a low image and are not as welcome as expected,” said Eric Shao, senior strategist, Interbrand China. Over 66 percent of the respondents said the Made-in-China label has hurt the nation’s brands, while a mere 6 percent said they are interested in purchasing Chinese brands. “Before the milk powder scandal, 59 percent of respondents believed the label hurts Chinese brands, but after that, the number rose to 66 percent, returning to pre-Olympics levels,” said Shao. “Fears about quality and safety were also reinforced,” added Jonathan Chajet, managing director of Interbrand China. It is these quality concerns that will hinder Chinese brands from going global. Added to that is the fact that the United States and Europe have scaled back purchases amid the economic downturn and also when producers from Southeast Asia, Africa, India and South America are offering a lower cost sourcing alternative. “Now is the time to remove the distrust and to focus and invest more on improving quality and building up brand personality to increase the competitive edge of Chinese products,” said Chajet. Apart from being cheap and practical, most of the Chinese brands usually “lack strong personalities needed to evoke emotional attachment and to also influence consumer purchases,” Shao said. The study said personalities refer to among other things, being innovative, attractive, fashionable and world-class and luxurious products of good value. The study is not fully a picture of gloom. It says that it is only a matter of time before Chinese brands break into the global rankings. Hi-tech sectors are expected to change the common perceptions as they expand in a carefully orchestrated manner along with coordinated acquisitions and make a mark for themselves in the global arena. The survey cites the examples of companies like Lenovo, Haier and Tsingtao Beer. “They are well on their way,” said Chajet. The 2004 acquisition of IBM’s personal computer division will help Lenovo increase its awareness worldwide. Appliance maker Haier Group acquired some local brands in the US in 2005 and is now the third largest player there behind Whirlpool and GE. Lenovo, the world’s fourth largest PC maker, also won more brand recognition during the Olympics as the only global sponsor from China and is set to become the country’s first brand ambassador, said the report. Emerging markets Emerging markets such as India, Russia, Southeast Asia, Africa, Middle East and Brazil may offer the best near-term opportunities for Chinese brands, said the report. This seems to be a reasonable alternative when the American and European markets slacken and take time to recover. The FTAs (free trade agreements) signed by China with the neighboring and emerging countries will help create easier market access for Chinese brands. Lenovo for instance has said worldwide PC shipments grew 14.6 percent in its most recent quarter, citing strong performance in China and EMEA (Europe, the Middle East and Africa) despite a flat growth in the US. Branding is not merely the business of the brand itself, but also requires government support. As the survey shows, the country of origin label is often a significant factor in a purchasing decision. More than 40 percent of the respondents are aware of this factor and would like to check the products they buy. “The Chinese government should embrace the art of branding and play an active role in the creation and management of China as a brand,” said the report. The government can drive a series of initiatives such as quality policies, market research, fair trade, industry organizations, and environmental awareness to build equity in China as a country that puts quality first. Next Article: Why the Chinese Consumer is more Complex than you think?